Starship Quest begins where Magnetic Moon ends, the story begins with Mike Erlin on the Stellar Queen, which is speeding away from the Magnetic Moon and its mother planet. The injured Commander Giles tells Mike that his crew had, before the tractor beam captured them, seen large cities and spaceflelds on the Magnetic Moon's mother planet. Mike thinks of the discs which were given to him by a priestess in the temple under the moon. Could their secret be hidden on the planet away from which he was now heading? He quickly found the Captain and told him of his suspicions. The Captain is Intrigued, but has orders to get Commander Giles to Rigel III, and refuses to stop to explore the planet. Mike has only one option... to jump ship and embark on a Starship Quest. At this point, the game starts and many, many problems begin. The game has been converted using the PAW and requires CPM+. It is in three parts (The Abandoned Planet, Marooned and The Last Starship) and each part presents many problems and difficulties. 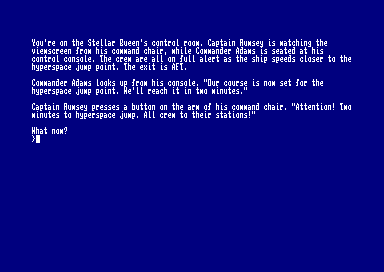 Part One begins with Mike on the bridge of the Stellar Queen, having just decided he must jump ship. He must collect the equipment which he needs and steal a lifeboat before the Stellar Queen goes into hyperspace jump - a mere two minutes away, so you only have so many moves to escape the ship, it is quite possible to escape from the ship without certain equipment which will be essential in later parts, so be warned! Having escaped the ship, your problems seem to multiply. You will have to deal with an underground tube system (and, alas, the tube car you find is as dead as a dodo), learn how to read alien writing and manage to launch a jeep which has an empty fuel tank. These are only a few of the many diverse problems which have been set - and which you will have to solve to proceed to Part Two. Having managed to get this far, you are stuck at a spaceport surrounded by a moat. To escape this trap, you must be very careful. A little further on, you will be chased by a wild animal and it is very much a case of planning your actions, and being ready to execute them quickly. The program continues if you take too long and by then It Is too late. And if this isn't enough, the woodlands abound with hostile natives who wouldn't mind having you for dinner... To escape from them requires a little thought and Ingenuity. Eventually, after having solved more problems, you will find a cave where you can rest and then be ready to tackle Part Three. 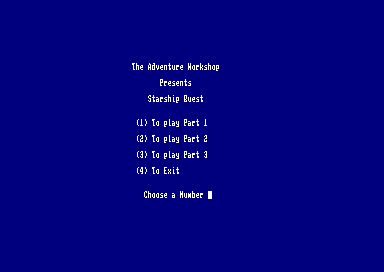 Starship Quest is a very difficult game and is aimed at experienced adventurers. I wouldn't be surprised If they find many problems to baffle and bewilder them. That isn't to say that the solutions aren't logical; they are. To those adventurers who relish a challenge, I cannot recommend Starship Quest too highly. The game has a strong science fiction element, which will appeal to many people who are fans of this genre. There are useful INFO and VOCAB commands which help with syntax and recognised verbs. Apart from one minor bug (which should have been removed by the time you read this), I found the game very impressive. 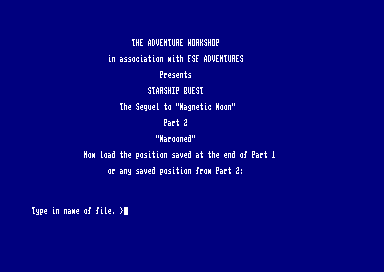 A first rate conversion by Philip Reynolds of Larry Horsfield's original game for the Spectrum.